In this article we will discuss how to make facebook integration with java. Websites are become an integral part of any business, be it small, medium or big. The web presence is an important aspect to reach the global audience. But only the website is not sufficient to reach the mass audience. For that the social media revolution is very important and it has a cascading effect. Now the social networking sites are also interested to get integrated with other websites as they also need to reach the mass audience. And in the similar way websites need the help of social sites to reach target audience. So, to complement this social sites have exposed their APIs and allows the websites to communicate with them. 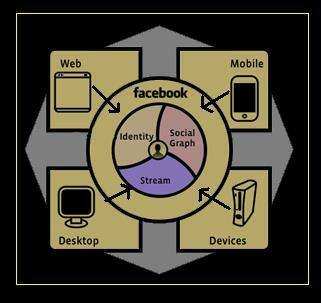 Facebook provides convenient Graph API to integrate with their site. The Graph API is very powerful and exposes all necessary features required. The following picture shows the facebook integration with different types of medium like web, mobile, desktop and many other devices. Now we need to understand the facebook application model to understanding the integration part. The proxy server model used by facebook is the main integration point with the application. Facebook uses REST web services to open its platform to the developers. Developers are free to use APIs to integrate facebook features in their application. And the most important thing is that the developers get the freedom to select any technology to develop their application. So the application development platform can be anything and facebook APIs are there to support it. And the developer should deploy their application in a way so that it can handle huge volume of data everyday. Before we start integrating our application with facebook APIs, we need to register our application (website) in facebook. Once you register your web application in facebook, access will be provided to the APIs. Please follow the steps below to register your application. Create facebook account and register your application there. Here it will be the website name. After this facebook will generate a client id and secret key for the registered web application. Before we integrate facebook with our java application we need some third party libraries. These libraries will help us communicate with facebook. Different groups of independent java developers have made efficient facebook libraries for integration purpose. You can check this link/ to get details. These libraries are compatible with Java SE 5 and above. You do not need the above three JARs if you are using Java SE 6 or later. After downloading these JARs, you need to incorporate them in your application. These JARs will provide you API access for different purpose. Following sample code shows the integration part. Apart from using facebook REST web service there are another option available to the developers. Facebook Markup Language (FBML) is another powerful offering from facebook community to support application development. Using this markup language developer can easily integrate their application without putting much effort. Apart from FBML, there are other utilities available for Ajax like effects. There is facebook query language (FBQL) which can be used for searching. All these can be used together and it will help us to make a complex application as per our requirement. There are many social networking websites available but facebook is most popular. And we have also seen that there are many different applications built on top of facebook APIs. There are also third party libraries available which can be used by java applications to interact with facebook. So to conclude our discussion, we can say that social media integration is a new dimension in developer's world and we should explore it as much as possible. hi bool, the first, thank you so much for this article. But, It's so great if you can tell me more. I am making a game in Java on the desktop. When finishing game, a button Share to facebook appear, and the user can share his/her point to facebook. Please tell me how to do this. Thanks a lot !